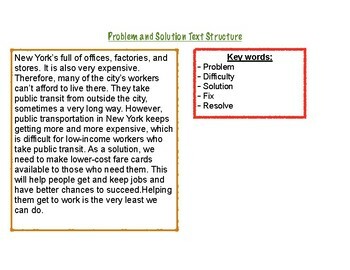 In this document, you will find a problem/solution text model (page 2). This can be used to model how to look for text evidence to determine what text structure this passage is. You will find on page 1 is a worksheet to determine which passage has the problem/solution text structure. For reference, the first passage is cause/effect. I hope this helps you as it helped me!